It's hard to express how much joy I find in discovering a new brand that is not only super chic but also BRITISH! As a journalist and stylist British brands are my number one priority and I couldn't be happier to introduce Alfie Douglas as my Handbag Crush this month. I spotted one of their bags during a breakfast with a friend who works at avenue32.com. When the conversation moved to their brands I began clicking through the website on my iPad until suddenly I spotted a bag from the 'Alfie One' collection and it was love at first handbag sight. The beauty in the collection lies within the simplicity of the designs and their sleek aesthetic. It isn't easy to design bags which combine style with substance and subtlety, but Alfie Douglas perfects the art of creating the classic, timeless bag. The family-run brand which began in 2011 is a collaboration between four sisters and their parents. Each bag is made and finished by hand with many being entirely hand stitched thus creating unique products. The brand places a priority on sourcing the finest sustainable materials. While I covet each and every bag within the collection my ultimate favourite is the structured tote in the Alfie One collection. I have a lot to carry daily and this tote is effortlessly stylish. 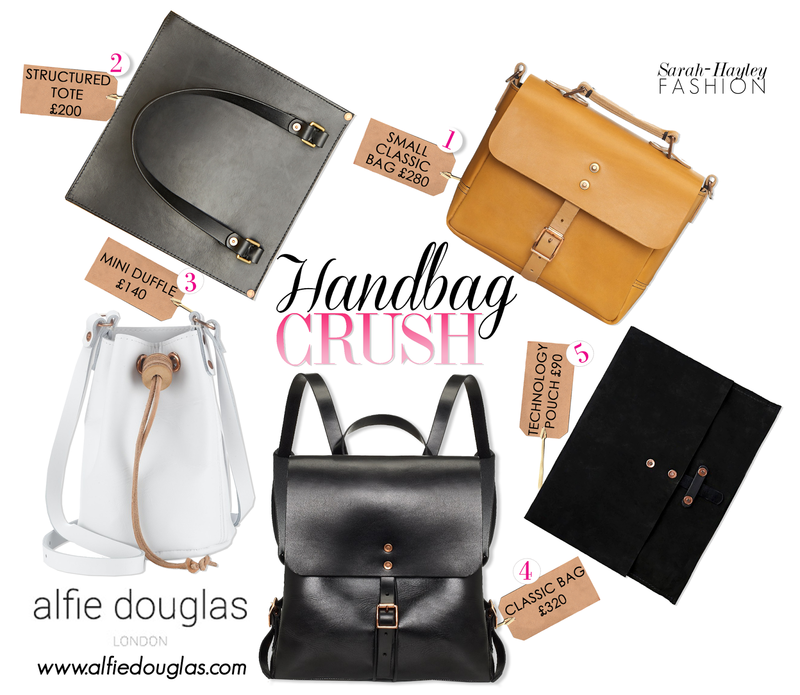 If you are looking for a bag to last a lifetime opt for a design by Alfie Douglas. In ten years from now you will realise the value of your investment.